animals aren’t aggressive and pose no literal threat to humans, but can hurt puts, cause extreme property damage and be a general nuisance on one’s property if not dealt with. For example, one way groundhogs cause property damage is by creating their massive underground burrows, which can undermine the structural integrity of the foundation. The soil could become unstable and it can be difficult to recover from groundhog damage, making it a priority to keep the creatures far away. The first way to keep groundhogs away from your home is by spreading pepper or hot pepper around your lawn. Groundhogs are heavily influenced by their sense of smell and heaving to constantly breathe in irritants such as pepper or cayenne pepper is a great way to keep the animals away. However, even if you spread the pepper around your whole yard or concentrate it in groundhog areas, it will dissipate in two or so weeks, necessitating you to redo the hard work of spreading the pepper solution. Another strategy is to surround your property with a fence, but this can be labor-intensive and difficult. As groundhogs are capable diggers, when placing a fence, you will have to dig a trench at least one foot deep. The fence will have to be made of mesh or metal, with no large openings and will have to extend into the trench to get around the groundhogs. Even still, the animals can dig under the fence or find another way onto your property if they are sufficiently motivated. Additionally, you can combine building a fence with another classic strategy- trapping the groundhogs. Setting out traps with baits is a tactic which works for many animals, but the only downside with groundhogs is that you have to deal with all the work if you trap a groundhog yourself. After all, they are large animals, and dealing with the actual trapping and transportation of the animal to a safe area to release it is a hassle in itself. Instead, it may be easier to leave that work up to professionals. 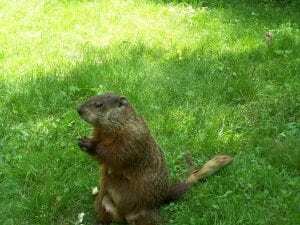 If you think you have a groundhog problem on your property, call the experts at Shumaker Animal Control to deal with the problem for you. Our experienced team will take care of the problem in a timely manner, ensuring that you, your home and pets are not in any danger. At Shumaker Animal Control, we are a family-owned business who cares about the safety of you and your family but also about the well-being of the animals themselves. All of our trapping and control methods are humane, as we never try to hurt the angry or scared animal. Call us at 443-854-8072 or view the online website at http://www.shumakeranimalremoval.com/ for more information. This entry was posted on Wednesday, April 3rd, 2019	at 9:01 pm	. You can follow any responses to this entry through the RSS 2.0	feed. Both comments and pings are currently closed. Are Foxes Dangerous to Humans and Pets? What Animal Problem Do You Have? Copyright © 2019 Shumaker's Baltimore Animal Control. All Rights Reserved. Website Hosting & Marketing Provided by Pink Dog Digital. Shumaker's Animal Control is centrally located in Baltimore county Maryland. We control and remove animals in Baltimore County, Baltimore City, Harford County, Anne Arundel County, Queens Anne County and Howard County,and we have a vast network of pest control and wildlife cooperators licensed to operate anywhere in the state of Maryland. We specialize in rat, groundhog, fox, snake, squirrel, raccoon, and mouse control, trapping, removal, and preventions.